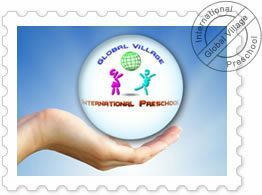 Welcome to the Global Village Saturday School Program. We are an international program serving the cities of Suita, Toyonaka, Takatsuki, Ibaraki, Minoh and Ikeda in the northern area of Osaka prefecture. We offer full day English immersion classes for children of both preschool and elementary ages, catering to children as young as 3 and as old as 12. Our aim is to strike a balance between the development of the four base skills of mastering language: speaking, listening, reading and writing, while also nurturing the social, emotional and physical development of our students. Through a variety of learning opportunities such as English conversation lessons, reading, writing, gym, music, computers, creative projects, and brain building exercises the students have a wide range of opportunities to encounter English and learn in a fun way. Our class sizes are kept to a high teacher to student ratio and we complement our younger classes with experienced bilingual Japanese staff. Please take a look around the site and, if you have any further questions, feel free to contact us. Thank you for visiting and we hope to see you with us here in the future!